As far as smart locks go, WiFi deadbolt locks are the ones that are best suited to help give its users remote access to the lock from any location in the world. This is not a universal trend for all WiFi deadbolts, but most of them have features that help their users accomplish this. Today I will be taking a look at some of the best WiFi deadbolt smart locks, and the features that help them achieve this. However, before I launch into that, I want to take some time to talk about WiFi deadbolts in general. What is a WiFi deadbolt? A WiFi deadbolt lock, in its simplest terms, is a deadbolt lock that can be controlled to some degree by utilizing WiFi connectivity. These WiFi deadbolt locks are smart locks, and they are often the perfect blend of smart locks and traditional locks. Their affinity for WiFi connectivity is the one feature that sets a WiFi deadbolt apart from their other smart lock contemporaries. Any homeowner that is actively seeking to add a WiFi deadbolt to the other smart devices present in their home often has security, oversight, and connectivity as their prime focal points. Although most WiFi deadbolts are used in a residential setting, there are some WiFi deadbolts that are well suited for use in commercial spaces. In fact, WiFi enabled keypad door locks are one of the most common types of commercial door locks. A WiFi deadbolt should have the ability to wirelessly communicate with a wireless router. The purpose of a wireless router is to convert and transmit the signals it receives from either the lock or the smart device meant to control it. After all, wireless communication is the main draw of WiFi deadbolt locks. A traditional WiFi deadbolt will be able to directly communicate with a wireless router in the absence of a bridge. On the other hand, non-traditional WiFi deadbolts require a bridge to establish a connection with a wireless router. However, wireless communication is not the only feature that consumers look for in a WiFi deadbolt. Some other ideal features of a WiFi deadbolt include device integration capabilities, remote access features, security push notifications, access control measures, etc. Understanding the features that most people desire in their WiFi deadbolt locks is integral to further understand the locks that will be discussed below. Every individual sees things from their own perspective, so categorizing something as the best requires a little bit of insight. In analyzing the locks below, I strove to hone in on the essential features of these WiFi deadbolt locks, and the ways these particular features helped enhance the core attributes of the lock itself. In a nutshell, how do these locks help users get more out of their locks in terms of connectivity, security, access control, and ease of use? Let’s try and answer this question by taking a look at some of the best WiFi deadbolt smart locks on the market. Many readers should be familiar with the August smart lock in some capacity by now. After all, it was a top contender in the smart lock wars, and it is still one of the most popular locks on the market today. The August smart lock is not a traditional WiFi deadbolt lock and relies on a bridge to establish a secondary wireless connection. A majority of the smart locks that are available for purchase make use of Bluetooth Low Energy (BLE) technology to establish a connection between the lock and the smartphone that is unlocking it. However, many of the locks that utilize BLE do not make use of WiFi connectivity. The few smart locks that do use BLE and WiFi do it in two ways. The first method is rather simple because all the parts that are needed to establish and maintain a wireless connection to an existing router are housed within the lock. The second method requires the use of bridge that serves as a connector between the lock and the wireless router. The August smart lock makes use of a bridge, which is why it is not a traditional WiFi deadbolt. Paired with the August Connect, the August smart lock evolves into a WiFi deadbolt that grants remote connectivity and control to its users. One of the features that made the August smart lock rather popular among homeowners, is that it can be installed right over your existing door hardware. This means that homeowners can continue to use their existing deadbolt if they purchase an August smart lock. It might not sound like much, but this simple feature gives customers the ability to customize their security and install a higher grade deadbolt if they so desire. Pairing the August Connect with the August Smart lock, creating a WiFi deadbolt, gives users the ability to remotely control their lock from any location. This enhances the way users can interact with their lock and opens up a new host of possibilities. For instance, no longer will you have to worry about leaving spare keys that might compromise your key control. Unfortunately, this does not extend to your spare car keys. Instead, you can lock or unlock your door to give people access even when you are not around. Also, this WiFi deadbolt allows you to monitor whoever accesses your home and your wireless front door lock. It does so by sending you security push notifications and system alerts whenever anyone manually unlocks your deadbolt or gains access through a traditional key or virtual key that you set up. Easy installation that allows you to use the existing lock hardware you already have in place. Stylish and sleek WiFi deadbolt that can blend in with almost any design style. Once paired with the bridge, the August smart lock allows you to remotely control your lock from any location. Push notifications will be sent to your phone each time that the lock is used so that you can keep track of whoever has access to your home. The August Connect that serves as the wireless bridge for the August smart lock requires an additional purchase. The BLE connection of the lock has been reported to lag, which often extends to the way it communicates with wireless bridge. The Lockitron Bolt is also a non-traditional WiFi deadbolt. Similar to the August smart lock that was just discussed, the Lockitron Bolt primarily utilizes Bluetooth Low Energy to communicate with smartphones. It should be noted that BLE ensures your lock does not consume large amounts of power when it is establishing communication with your smartphone. It also limits your wireless connectivity to a radius of approximately 50 feet. This truly limits the flexibility that homeowners might have. Luckily enough, this lock can also be paired with a WiFi bridge, which the company has dubbed Bridge. I was utterly in awe at their originality, but that is beside the point. With the help of Bridge, the Lockitron bolt becomes more than just your average smart lock, and moves up into the realm of a WiFi deadbolt. Similar to some of its counterparts, this lock elevates the kind of connectivity users have to their WiFi deadbolt, and it allows them to monitor and command their lock from remote locations. However, this is not the most interesting thing that comes with the Lockitron bolt. The Lockitron gives its users access to the Lockitron Application Program Interface (API), which allows users to program some of the actions they want their lock to carry out. These programmable actions range from being able to lock and unlock your door, to revoking access to the lock. Essentially, not only does this WiFi deadbolt grant its users the ability to remotely control their lock, it also allows them to program, which in itself opens up a world of possibilities. 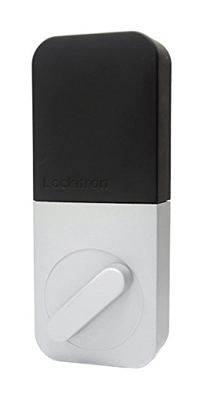 The Lockitron bolt might very well be the cheapest WiFi deadbolt to be found on the market. It gives homeowners the luxury of a connect smart lock without over extending their budget. The lockitron is easy to install and requires very minimal additions to be made to the state of your current hardware for the lock to be operational. The lock does come with its own keyed cylinder, strike plate and other integral components. Although the Lockitron bolt is a relatively cheap lock, the WiFi bridge requires an additional cost, which increases the overall cost of the lock. The lockitron bolt is not well equipped to integrate with other smart home devices, which limits the amount of communication you are truly able to achieve. Although you can monitor the lock and communicate with it remotely, you will not be able to extend its features through device integration. Unlike some other smart locks, the lockitron bolt does not make use of any automatic unlocking features. 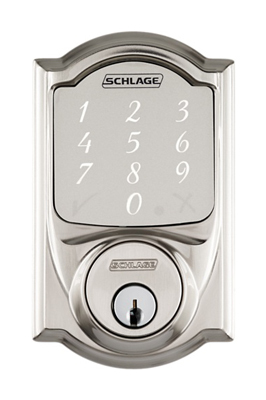 Schlage is a name that most readers can identify with because they are a prominent part of the lock and security community. The Schlage Sense is a deadbolt smart lock that carries on this tradition and seeks to make homeowners feel secure within their homes, while simultaneously giving them the tools they need to enhance the connectivity and control they have over their locks. As I touched on earlier, access control is an integral feature many users look for when they seek out WiFi deadbolts. The Schlage Sense is able to do deliver this to its users without having to skimp on security or connectivity in any way. The Schlage sense is one of the more secure WiFi deadbolt locks that are in circulation today. The lock itself consists of commercial Grade 1 rated single cylinder deadbolt that is reinforced by an optional security plate meant to serve as an anti-pick protocol. There is also a built-in alarm that serves as an additional security measure in case anyone decides to tamper with the lock. In addition to all these beneficial security features, the Schlage sense deadbolt also acts as a WiFi deadbolt when it is paired with the Schlage Sense WiFi adapter. The WiFi adapter is a bridge that helps establish a connection channel between the lock, a wireless router, and the smartphone or device that is intended to operate the lock. The adapter itself is small and lightweight, which makes it easy to find a spot for in any home set up. The Schlage Sense WiFi adapter allows this formerly exclusively bluetooth lock to give users unparalleled access to their lock. The lock can now be controlled from any location, simultaneously enhancing connectivity and security. The schlage sense app that is used to control the lock via the user’s smartphone is free and easily accessible. This lock was once exclusive to iOS devices, but is now compatible with Android devices. Which means that there are now more users that can take advantage of the lock. The Schlage Sense WiFi bridge includes an additional cost, similar to most WiFi bridges. The Danalock is also primarily a Bluetooth smart deadbolt that has the capabilities to be used as a WiFi deadbolt inside the home. Unlike its counterparts that have been discussed up until this point, the manufacturers behind the Danalock do not seek to charge you a hefty price for WiFi capabilities. This version of the Danalock is the second iteration of the lock, and it seeks to improve upon the flaws and issues that users had expressed with their previous outings. Most of the issues that people had with the earlier model of the lock revolved around the locks operation. There were very few problems that focused on the nature of the deadbolt itself because the Danalock follows the lead of the August smart lock and builds upon your existing foundation. This existing foundation refers to the deadbolt that might already be in place. The Danalock makes use of a bridge, much in the same way the locks above do. However, remember when I said it doesn’t require the additional purchase of a bridge? The Danalock allows you to turn any existing smart device into a WiFi bridge that can then be used to control your door lock. This allows users to remotely access their locks without having to go out and acquire a separate device. Most of the homeowners who would want to include a Danalock in their home as a smart lock will most likely have an additional device close by that they can utilize as a WiFi bridge. The Danalock allows you to configure an existing smart device as a WiFi bridge, rather than compelling you to purchase an additional device that can only be use as a bridge. Danalock boasts the strongest global smart lock encryption by making use of military grade AES-256-bit encryption. This lock offers easy installation very similar to the August smart lock. It allows users to make use of multiple wireless protocols rather than just restricting them to just one. This gives users multiple ways to use their locks. In comparison to other smart locks, the Danalock does not have a fluid opening motion, which limits its aesthetic appeal. I should start by saying the RemoteLock 5i-B WiFi deadbolt is probably not the most secure wireless front door lock on the market. Please do not get me wrong, the RemoteLock is a standout lock that has much to offer, but the feature that tips the scales in its favor is connectivity, not security. 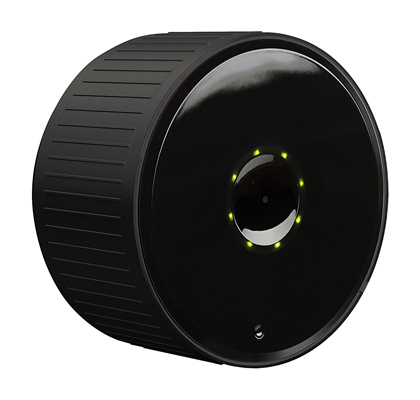 Unlike the locks that have been discussed, the RemoteLock is a traditional WiFi deadbolt that can directly connect to a wireless router. This simply means that there is no need for homeowners to purchase an additional WiFi bridge to be able to take advantage of remote connectivity. The RemoteLock WiFi deadbolt is compatible with standard WiFi networks, which saves many homeowners the hassle of having to upgrade their gear simply to accommodate other smart devices. 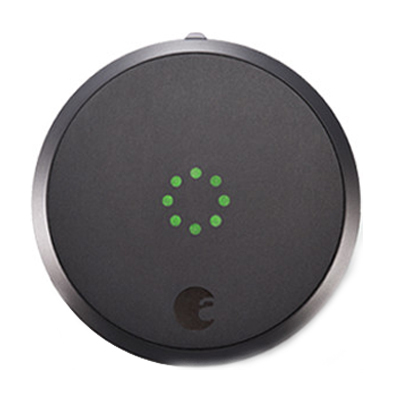 In addition to its connectivity features, the smart lock also helps users achieve a high level of access control. 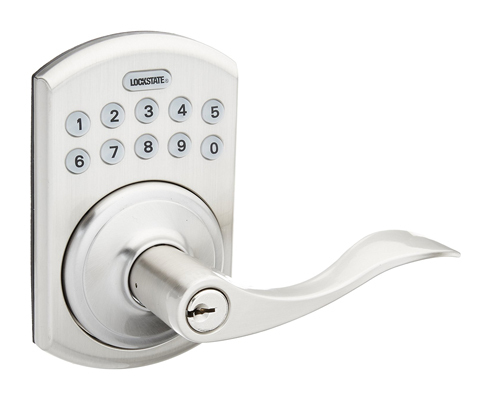 The lock is capable of storing up to 1000 user codes, and is primarily geared homeowners who rent out their homes. These features of access control and remote monitoring increase the security that your home is afforded because it allows you to control access to your home while also monitoring the way it is accessed. The RemoteLock 5i-B does not require the use of a WiFi bridge. The lock itself is capable of readily connecting to an existing WiFi router. Allows users to view the locks history in real time, while also allowing users to remotely operate the lock and grant or restrict access. Increases the amount of oversight that homeowners have by issuing alerts and push notifications whenever the lock is accessed in any capacity. This ensures that homeowners are constantly aware of the way their lock is performing. In order for the remote connection to work, this lock requires a small monthly service fee of $0.99. The lock does not have many integration capabilities. It can be connected to the RemoteLock access control system, but it is still limited by the mobile application that it works with. Do not think that the locks mentioned above are the extent of WiFi deadbolts that are available for purchase. These are simply the best ones, and the ones that will most likely satisfy the needs of homeowners who are seeking to purchase WiFi deadbolts. Always keep in mind that the prime importance of any deadbolt lock is to stay locked and to restrict or grant access. Do not lean so heavily on connectivity that you forego the basic tenants of security in the process.